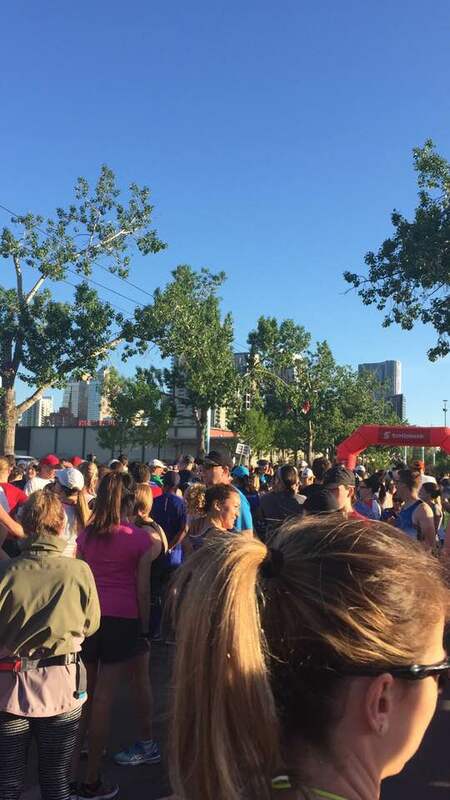 The Calgary Marathon weekend officially starts on the Thursday before the race and continues until Sunday evening. It is a well organized event and I am happy to be a part of it. It is such a great atmosphere and I love to see how (most) Calgarians seem to embrace the event with their cheering and support. I love seeing everybody along the streets with signs and cowbells, it is really encouraging to see it all. On Thursday, I skipped my regularly scheduled run for the second Thursday in a row because I was so afraid of making my knee or achilles hurt more. 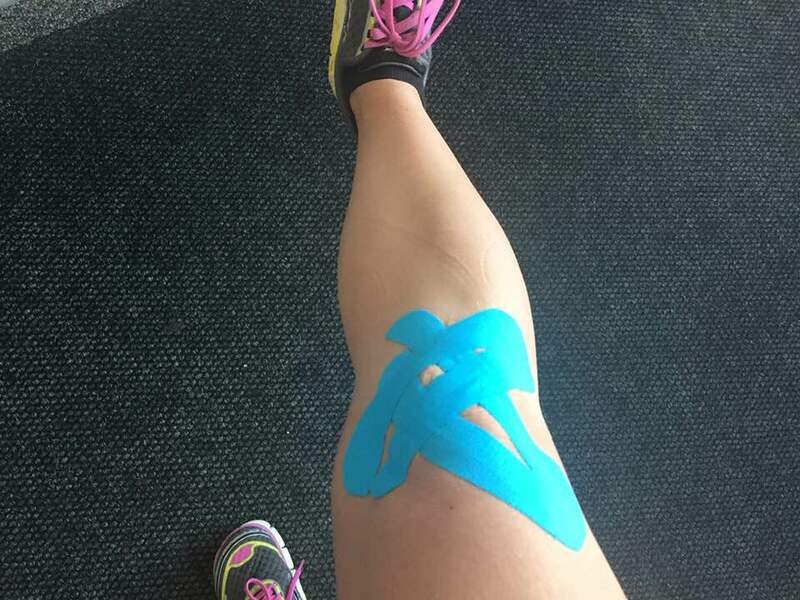 I went to see Shari so she could work on my knee and tape it up for me and she also needled my calf because it was super tight and it would help eliminate or at least decrease any achilles pain that I might enocunter on race day. I left feeling good and cautiously optimistic haha. On Friday, I spent the day volunteering down at the Big Four Building doing package pick up. 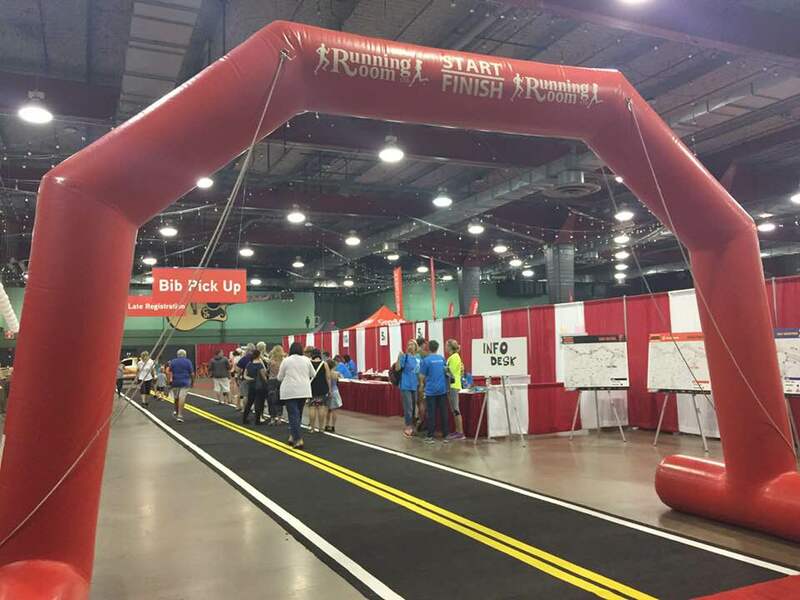 I was at the marathon table and so we checked in all of the marathon runners and handed them their bibs. 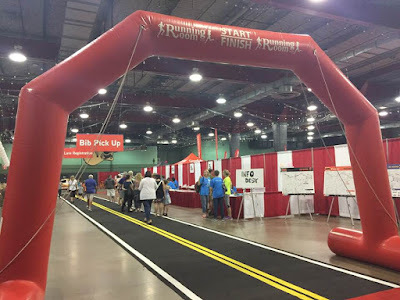 Since it is not the busiest race, we also did check ins for the half marathon and 5km races since they are the two busiest races and the occasional 10km race too. I loved volunteering for package pick up and chatting with all of the runners. I was really surprised that there were so many people who come from all over Canada and even the world to run this race. As someone who runs about 4 races a year, I think it is important to give back and help out in the race community. I can't wait to do it next year! The shirts this year were pretty nice. 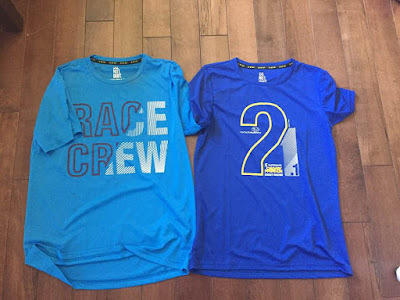 The one on the left is the shirt all of the volunteers wear. The one on the right is the shirt you get for running the half marathon. I hate that the official colour for the half is blue and that all of the shirts are usually blue hahah but at least this is a nice shade of blue and a nice shirt as far as race shirts go haha. On the back they both say RunCalgary which is who organizes this race and so many other great races here in the city. On Saturday, I basically did nothing but stretch, roll and watch netflix. Greg brought me home some sushi after he and the girls went biking. Sushi is my go to meal the night before races when I am home in Calgary. Greg went for beer and I got the kids to bed and headed to bed early myself. Unfortunately my neighbors did not go to bed early haha. Normally I would be annoyed but my neighbors are the quietest people and have only had one ever party in the 5 years they have lived there so instead of being angry, I just shut all the windows and went downstairs to get my fan that I keep by my treadmill and I was able to finally fall asleep. Race morning, I was up at 5am and quickly had some poached eggs and got my stuff ready. I was so worried that I was going to forget something but thankfully I didn't. I was ready to go far too early and basically sat and did nothing for about half an hour until it was time to leave for the train station. I randomly ran into some friends in the parking lot at the train station so we rode downtown together. It was nice to have someone to chat with instead of overthinking the race. We got to the grounds around 6:42am and I went right to the starting corrals to get ready for the start of the race. It started filling up quickly but it definitely wasn't as full as the year before. Last year, we couldn't even get into a corral until after the race started. I was pretty nervous and terrified that my knee and/or achilles wouldn't hold up. Once we crossed the start line and I started running, both my legs, feet and ankles were hurting in a way I can't quite explain. Immediately I went into panic mode and starting thinking if I would be able to finish the race, how much time I would need to take off from running to heal, would i be able to run my next half marathon next month? Thankfully the discomfort didn't last too long and I was good to go. 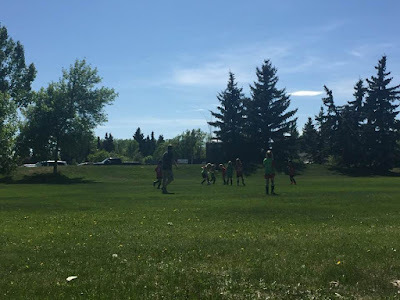 I did walk up the hill that led us to bridgeland, most of the hill up 14th and the last hill by the enmax building there near the end. The first hill walk was because I was afraid of hurting my achilles and the last 2 were because I was both tired and still worried haha. My run was going really well until about km 16 and my hips started to hurt so bad. My knee and achilles held up really well but not the hips. As I am writing this Monday night, my right hip is still killing me. It is very much looking forward to the massage on Thursday. Most likely, my hips were hurting because that was the fastest I had run since my half marathon in September. I think I need to push myself more in my training runs, especially my 5kms to help my hips. There was so much race entertainment and it was all pretty good but my favorite was the guy who was dressed like the will ferrel character who wears the belly shirt and jeans and plays the cowbell. It was fantastic. We passed him twice and it made me smile both times. I did an instagram poll on which shorts to wear and when I went to bed, the green shorts were winning and I really wanted to wear pink and when I woke up, pink had taken the lead but for some reason I decided to wear the green ones. I was wearing the new Lululemon limited edition swiftly for the Calgary Marathon no matter what color I chose for the shorts. Incidently, I asked last year for input on my shorts and still went with a different pair. I think it is time i quit asking haha. This was the first race i have ever gone into with a goal time. All I wanted to do was finish strong and have fun. I no longer want my time to determine whether or not the experiece was good or bad. We are all going to have bad runs, that much is inevitable but we need to embrace these runs as those are the ones that make us the strongest. All of my training runs have been turtle like slow. I am not exaggerating. My longest training run was 18.47 three weeks ago and I ran it in 2:41:04. Yesterday's run, which was 22.16 on my watch, came in at 2:34:49! I was almost 2 minutes faster then my training runs. I know you should always be faster during a race but I was really surprised by the speed that somehow came to me. My next half marathon is on June 24th which isn't that far away and I am not sure if that is enough real recovery time to improve on my pace but I am running it was a bunch of girlfriends so I know it is going to be a fun race no matter how I finish. The temperature was cooler then last year and even though I finished this race 6 minutes later then I did a year ago, it just felt so much easier. I was shocked when I saw on my watch that I had already been running for an hourt because I was really enjoying myself. I am not sure if that is related to taking the pressure off of me with no goal time or what, but it felt really good. 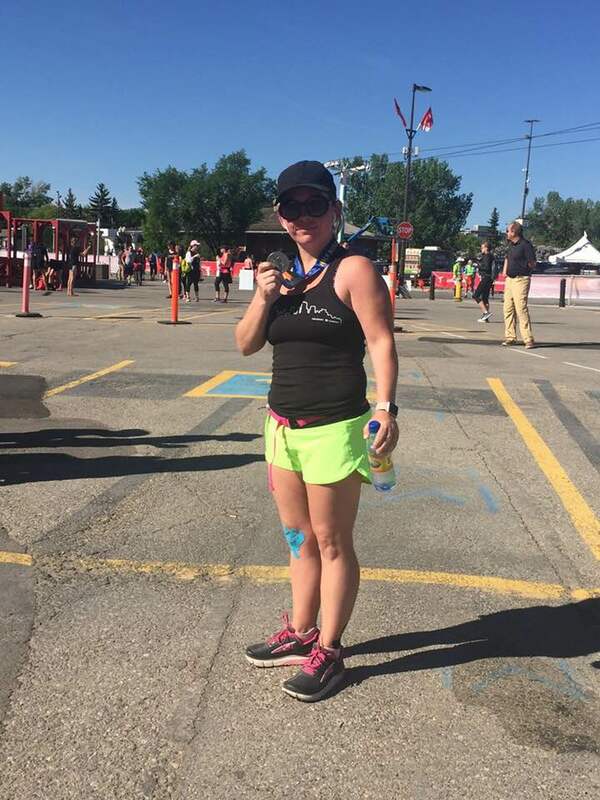 I remember last year, coming into the stampede grounds and working my way to the finish line and feeling like I wanted to die. I was hot and tired and I felt like I had nothing left to give. This year, it was the opposite. I got into the grounds and as soon as I turned the corner, I ran as hard as I could - pacing so many people and finishing so strong. I was proud that I was able to cross the finish line feeling so good. 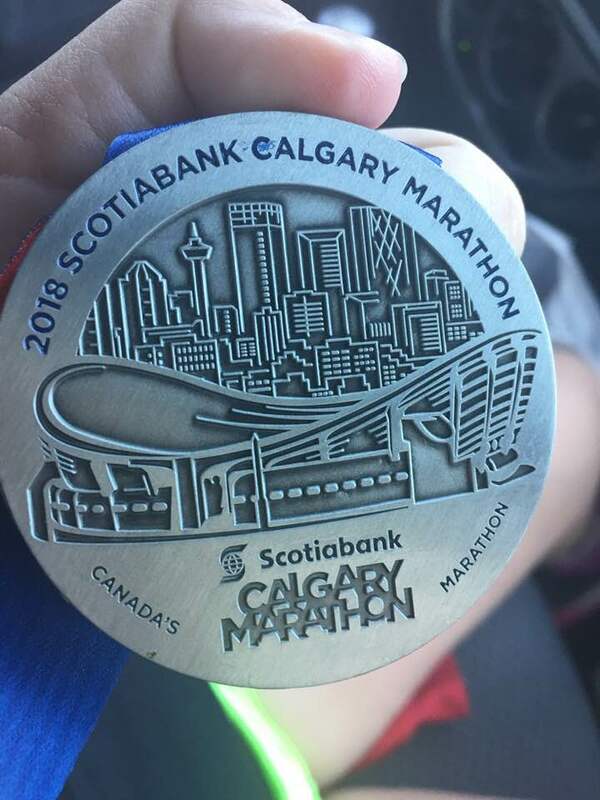 Earlier this year, or maybe it was late last year, RunCalgary put up 4 local YYC landmarks that we could vote for to be on our medal this year. One was the Saddledome and one was the Simmons Building and I don't remember what the other 2 were. I voted for the Simmons Building becasue it is one of my favorite areas in Calgary but as you can see above, it didn't win. Even though I didn't vote for this landmark, it is still a really cool medal that i am happy to have in my collection. After the race, we headed to The Beltliner for brunch. 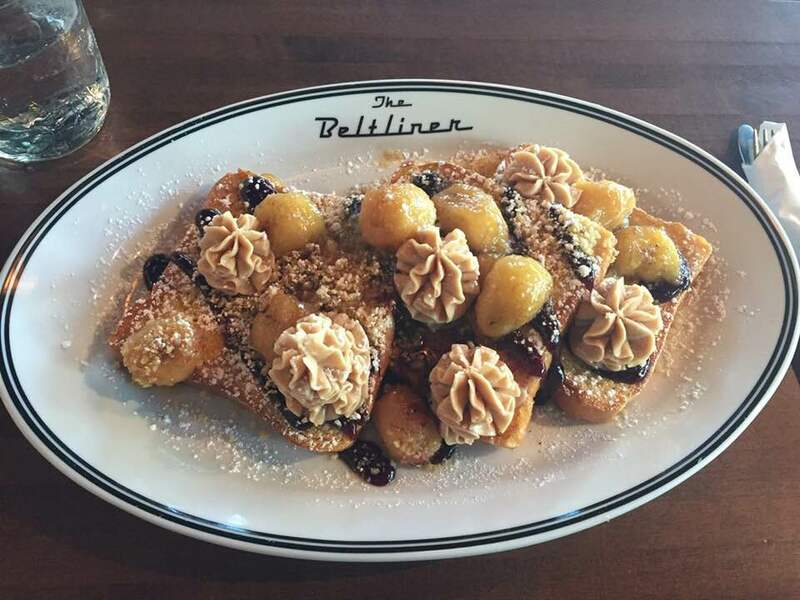 I had the french toast 3.0 which was french toast, jam, whipped peanut butter, bananas and crunchy butter. It looked fantastic but it wasn't great. I was originally going to get bacon and eggs but changed my mind last minute and I really wish I hadn't. I really just wanted to go home after my race and sleep but unfortunately both kids had soccer photos and Penelope had a soccer practice. I had a quick bath and then got ready to go. Our original plan was for Greg to take Finley to the photos and I would meet him there for Penelope's photos and then I would take finley home and he would take Penelope to practice. I am the team manager so I have to be in the photos. Also something I didn't want to do after a race haha. However, since our coach is a male, one mom has to be at all practices in case one of the girls gets hurt and all the girls were brought to photos by their dads so I had to go to practice instead of Greg. It was so hot and so little shade was available at the park. I drank all of my gatorade, water and one of Penelope's water bottles. After practice, I took her and one of her teammates for slurpees on our way home to cool off. It was well deserved. Greg was making supper when we got home and I was excited to see potstickers which are one of my favorties. I devoured them quite quickly. I tried to write this blog but was far too tired for it to be any good so I went upstairs to watch basketball with greg but couldn't stay awake so I headed to bed early since I was wiped right out. I was so sore and tired that it took me forever to fall asleep and 24 hours later, I am still super tired and really sore on my left hand side. Hopefully when I wake up tomorrow (today), my hip is much less sore. If I can walk to school without limping that would be great haha. It was a really great race weekend and if you are a runner and you like to run half marathons and you live in Calgary or don't mind traveling to a race, I really recommend this one. I love the entire weekend as I have mentioned before both on this blog and on social media. There is something really special about running at home and I hope to keep running this race for as long as i possibly can. Come run with us next year, you won't be disappointed. And if you are not a runner, come volunteer. Volunteers are the most important and you can't have these events without the amazing volunteers! 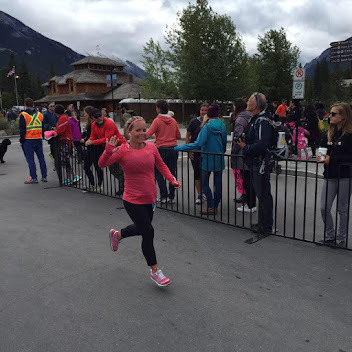 Finley and Penelope also ran in the Calgary Marathon but you will have to wait for their recap until tomorrow.